This recipe doesn't really have a good story behind it other than the fact that I had two over-ripe bananas that needed to be used up. Those bananas, along with a can of pineapple and some coconut oil turned into these delicious Banana Pineapple Coconut Mini Bundt Cakes! 2. In a separate bowl, combine Eggs, Banana, Pineapple, Coconut Oil, Butter and Juice. Mixed together till all ingredients are well in combined. 3. Make a well in the middle of the flour bowl ingredients and add all the wet ingredients. Slowly stir together till combined. do not over beat. 4. Add Pineapple Coconut Banana batter into each of the cups, filling 3/4 full. 6. Remove from heat and cool for 10 minutes. Remove from cups and put cooling rack to cool completely. 1. Combine powder sugar and pineapple juice. 2. Drizzle on top of each of the mini cakes. Let a few minutes pass for the glaze to dry. For this month's Leftover's Club I was paired with Kim from Feed Me Seymour. Kim is a Freelance Journalist and you can tell from reading her Blog that the woman knows her stuff. Her photos are gorgeous and her writing flows beautifully. I have to admit, I was a little (ok, maybe more than a little) intimidated to be paired with Kim. My writing and photography skills pale in comparison. I deliberated for quite a while about what to bake for her and after reading several of Kim's posts, I discovered that she doesn't really like fruit baked in her desserts (bummer), but she does like Pomegranates! Score (or so I thought!). I should have realized Pomegranates were not in season. Luckily, after searching high and low, I was able to find fresh Pomegranate arils at Sprouts! I used the Pomegranate seeds to make this homemade Pomegranate Raspberry & Thyme Jam which I used as a filling for my favorite shortbread bars. Instead of using fresh Pomegranates, I used the fresh Pomegranate arils. 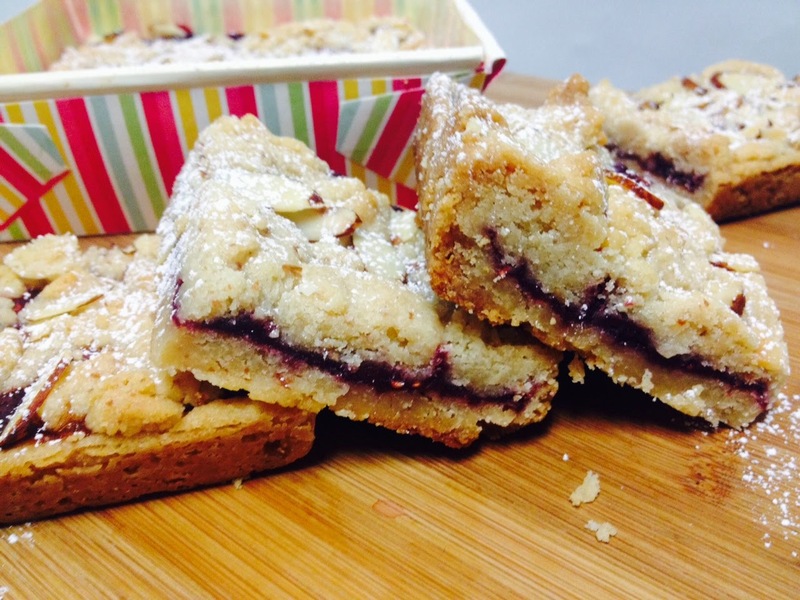 I've raved about these shortbread bars here. This is my absolute favorite shortbread bar recipe. The almond flour, sliced almonds (and plenty of butter of course) are simple perfection. The tartness of the Pomegranate and Raspberry along with the hint of lemon from the fresh Thyme pair really well with the buttery sweetness of the shortbread. This recipe only requires a few ingredients so make sure you use the best especially if you use store bought jam. Bonne Maman is one of my favorite brands. I really hope Kim enjoys these bars as much as I do! If you're interested in joining The Leftovers Club, please sign up over at Food Ramblings. I've been a member of the club for several months now and I love receiving (and sending) goodies to fellow bloggers every month! Now on to the recipe....I have to apologize for the horrible photo. I had a kitchen mishap while baking these bars and broke my lens so I had to use my phone : ( I promise to update with better photos as soon as I have them. Line an 8" baking pan with nonstick foil or spray regular foil with nonstick spray. In a small bowl, combine the flour and almond meal. Set aside. Place the butter and sugars in the bowl of your electric stand mixer fitted with the paddle attachment. Beat at medium speed until cream (approx. 1 1/2 minutes). Add the vanilla and salt and mix just until combined. Add the flour mixture and mix on low speed just until combined. Wrap half of the dough in plastic wrap and place in freezer. This part of the dough will be used for the crumb topping. Press the remaining half of the mixture into the bottom of your prepared baking pan. Bake at 325 for approx. 15 minutes or until the edges are light golden brown. Remove from the oven and allow to cool for 10 minutes. Gently spread the jam over the top of the crust being careful not to disturb the crust. Crumble the remaining crust over the top of the jam and sprinkle with sliced almonds. Return to the oven and continue to bake for another 30 minutes or until top is golden brown. Remove from oven and allow to cool. Sprinkle with powdered sugar, slice into bars & serve. Lately Faye and I have had the opportunity to cater a few Showers which is fun for us because we get to test out new recipes on people we know and also celebrate the special occasions in our friend's lives. For this particular shower our menu featured fresh ingredients which is perfect for Spring! 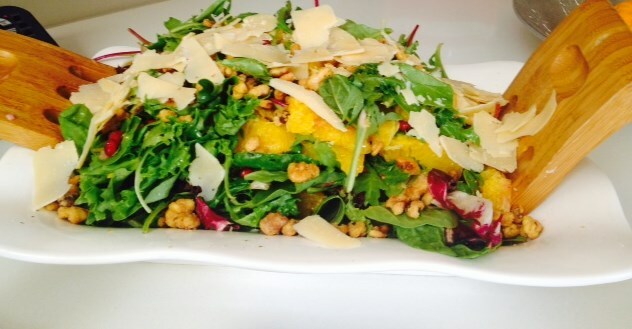 The featured salad, Mixed Greens with Orange sections and Pomegranate Seeds. 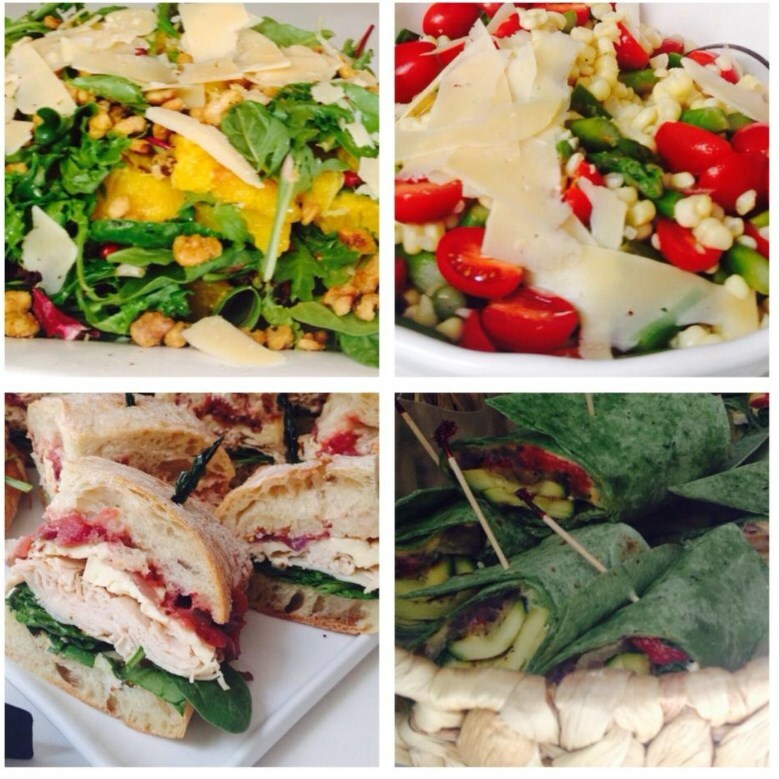 Also on the menu, Corn and Asparagus Salad with sweet Cherry Tomatoes, Turkey & Brie Panini with Apple & Cranberry Chutney and Fresh Grilled Veggie & Hummus wraps. We ended our healthy meal with dessert of course! After all, all that healthy eating makes a girl hungry (ha!). Strawberry Shortcake Cupcakes with fresh strawberry filling and whipped cream topping, Chocolate Merlot Cupcakes with a white chocolate filling.. let's just say it was another successful event catered by LiveBakeLove. It's funny.... even though Faye and I cook (A LOT), we still manage to learn new things all the time. For me, my salad recipe required segmented oranges and I wasn't sure how to segment an orange correctly. Thank God for the internet! This nice lady Trish has a great instructional video ( https://www.youtube.com/watch?v=9k2ths-wsxI ) which I followed and voila! I segmented all of the oranges perfectly! Thanks Trish!! Now back to the featured salad....this is salad is delicious! The recipe was given to me by a coworker. It's simple, healthy and has amazing flavor. You will love the lemon dressing and the pomegranates and oranges give it just the right amount of sweetness for a savory salad. I hope you give this salad a try for your next event or just for yourself ! 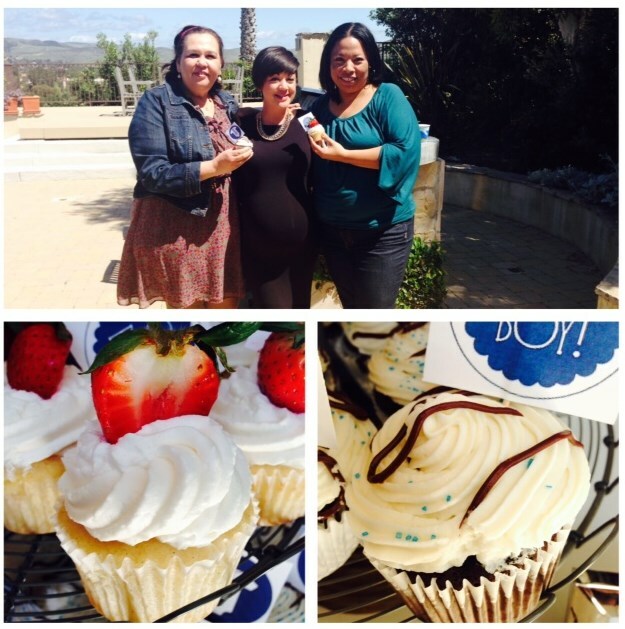 And to Paola and Jeremy, congratuations on the little guy... LIVEBAKELOVE cannot wait to meet him! Dressing: Mix all ingredients together and put in refrigerator until ready to use. Salad: Combine all ingredients except for the nuts. Refrigerate for 30 minutes. Add nuts and dress. Serve.